Review: By 1968 the United States was heavily committed to keeping a large military force in Vietnam to prop up the corrupt South Vietnamese government, and ostensibly to defeat the North Vietnamese insurgents. Despite optimistic reports to the press of American progress towards victory, Secretary of Defense Robert McNamara (Bruce Greenwood) commissioned a detailed study by the Rand Corp. to assess the true picture of the war in Vietnam. One of the people working on the document was a former marine officer and special assistant in the Defense Department Daniel Ellsberg (Matthew Rhys), who had spent two years in Vietnam and was very familiar with how the war was proceeding. In short, Ellsberg advised his bosses that the war was at best a stalemate. By 1971 Ellsberg has had an epiphany; his conscience dictated that he needed to take action to bring the war to a close, or at least let the public know the real truth of American involvement in Vietnam. With access to the Top Secret 7000 page document that came to be known as the Pentagon Papers, Ellsberg made copies. Going underground and staying on the lam to avoid arrest, Ellsberg managed to get a portion of the Pentagon Papers to NY Times reporter Neil Sheehan (Justin Swain). 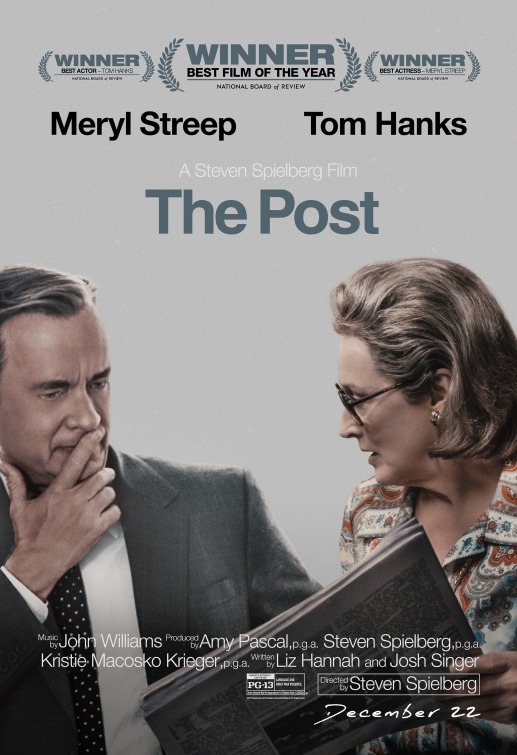 Rumors of this explosive story carried its way to Ben Bradlee (Tom Hanks), executive editor of the Washington Post, and Bradlee was determined to get the story as well. Despite words of caution from Post owner and publisher Katharine Graham (Meryl Streep), Bradlee’s reporters got themselves into the game with the rival NY Times, and stories about the truth of America’s involvement were published in newspapers for all the world to see. Naturally the Nixon White House was enraged, and triggered the most important discussion and legal battles in history concerning the freedom of the press as defined in the First Amendment. This is a milestone film. It is a taunt, well constructed narrative depicting real events that are critical to American history. It is both a suspenseful film, and an inspirational story without being preachy or heavy-handed. The acting is top notch with an all star cast. Besides Tom Hanks and Meryl Streep, both likely candidates for Best Actor and Best Actress Oscar nominations, Bob Odenkirk and Matthew Rhys are major assets that upped the level of talent in this production. The film is not only hugely entertaining to watch, it is a riveting story that needed to be told. And yes, it has the additional merit of being timely, as once again government forces are assaulting the press with accusations of “fake news”. Go see this movie. For my money, it deserves to win the Best Picture Oscar. In the First Amendment the Founding Fathers gave the free press the protection it must have to fulfill its essential role in our democracy. The press was to serve the governed, not the governors. }The Government’s power to censor the press was abolished so that the press would remain forever free to censure the Government. The press was protected so that it could bare the secrets of government and inform the people. Only a free and unrestrained press can effectively expose deception in government. And paramount among the responsibilities of a free press is the duty to prevent any part of the government from deceiving the people and sending them off to distant lands to die of foreign fevers and foreign shot and shell. … [W]e are asked to hold that … the Executive Branch, the Congress, and the Judiciary can make laws … abridging freedom of the press in the name of ‘national security.’ … To find that the President has ‘inherent power’ to halt the publication of news … would wipe out the First Amendment and destroy the fundamental liberty and security of the very people the Government hopes to make ‘secure.’ … The word ‘security’ is a broad, vague generality whose contours should not be invoked to abrogate the fundamental law embodied in the First Amendment. Review: Molly Bloom (Jessica Chastain) was on the U.S. Ski Team, pushed hard to succeed by a demanding father (Kevin Costner), and about to make it to the Olympics when her world crashed around her. Smart as a whip with a 3.92 GPA in college with plans to go to law school, Molly decides to head to Los Angeles to figure out where her life should go. Needing to make a living, she does the cocktail waitress thing, and attracts the attention of a rich developer who needed an assistant. As a sideline, the dude was running a high stakes poker game in West Hollywood, and soon Molly was invaluable in helping him line up players and track the money paid on a computer spread sheet. Molly, smart lady that she was, kept her ears open to the poker lingo, and observed how the men who consistently won played their cards, like card shark Player X (Michael Cera), and became an expert at Texas Hold ‘Em poker. Fast forward a few years and Molly is the sole owner and operator of the biggest and most sought after poker game in Los Angeles. Big name actors and producers were regulars, as well as millionaire athletes and titans of industry. Players better have $250,000 on them, because that was the cost of a buy-in to play at Molly’s games. Molly was making a bundle for herself, and even doing it legally. And yet, it all came tumbling down. Enter the FBI, criminal charges, and Charlie Jaffey (Idris Elba), the legal eagle trying to keep Molly out of jail. This film is a fascinating story, in part because it is based on the real life trials and tribulations of a real person named Molly Bloom. The story veers away from a strictly factual plot in a few ways, but the gist of Molly Bloom’s travails are on the screen. Jessica Chastain gives a powerful performance as Molly, and should be a cinch to get a Best Actress Oscar nomination for her portrayal. The movie as a whole is well worth your time, and anyone who is knowledgeable about poker will be enthralled with the action at the tables. Go see this one. Nitnoid Info: The movie mentions how casinos put scents into the air to increase the urge to gamble. According to scenting experts, it’s smart to emphasize cleanliness in the development of casino scents because it has an effect on perception, especially in casinos where patrons spend days not hours within the service environment. Signature casino scents are all different as often each hotel is trying to invoke a different region of the world; The Mirage is Polynesian; Mandalay Bay is Southeast Asian and the Bellagio whispers of Northern Italy. The success of defining these scents starts with understanding that the third sense as being very tricky. (It isn’t like a story with three different sides; his, hers and the truth.) Everyone takes in the aroma, whatever it is, exactly the same way. The difference in reaction lies in the memories associated with that aroma, which are different for everyone. That said, there are certain guides with which scenting strategists works; citrus aromas are refreshing; floral, cedar and other woodsy scents are soothing and relaxing as are herbaceous aromas which can also be invigorating, such as peppermint. What Was Not In The Movie: Molly Bloom was very careful to not reveal the names of famous people who played in her poker games. Some names have slipped out, including Ben Affleck, Leo DiCaprio, Matt Damon, and Yankee star Alex Rodriguez. Of yes, and that mysterious and ruthless Player X appears to be actor Tobey Maguire.